We inhabit a competitive world. Dogs vs. Cats. Star Trek vs. Star Wars. Buyers vs. Sellers. Too often, however, this competitive nature prevents effective collaboration. The newly launched Coalition of Professional Services Providers is a step in the direction of establishing a mutually beneficial relationship between those who offer services and products to professional services firms, and the professional services firms who buy them. In the legal segment, most of the professional associations are exclusive by nature, indeed almost combative. Only practicing lawyers can join this group. Only chief marketing officers can join that group. Only buyers of a specific legal technology product are allowed to join a discussion of the product. And so on. Major conferences often have a bias for in-house professionals as presenters. "We must be protected from vendors trying to sell us something," they say, thereby eliminating input and advice from experts who may have seen 75 implementations of a specific tool or process, in lieu of an in-house practitioner who has deployed the tool only once, in only one organization, and is leveraging the speaking opportunity to find a better paying role. Of course not every in-house presenter has such limited experience and of course they're not all seeking a new job. But if you stipulate to that you must also stipulate that not every vendor is going to rashly use podium time to pitch a product that the audience doesn't need or want and instead will provide useful education and practical takeaways. "For the low, low price of $10,000 you too can be in the same room with people who might someday influence a buying decision!" says the brochure for the local chapter of a professional legal association, promoting this opportunity to all vendors and service providers as some sort of exclusive benefit that can't be gained otherwise. "For $20,000 you can put your logo on napkins and the president of our association will nod curtly in your direction during the cocktail reception," they breathlessly exclaim. "But there may be no eye contact, and you're not allowed near the podium because of the potential risk that you might begin selling." And my favorite: "You may purchase an expensive advertisement on the back cover of our trade magazine to show your support, but you may not attend the workshop for buyers of your product, where the top agenda item 'If Only We Had a Better Understanding of How to Use the Product' is sure to provoke lively discussions." While these are somewhat exaggerated, they ring true for many of us who have been on both sides of the buyer/seller equation. What's missing in some cases is a sense of collaboration, an understanding not just that we need each other, but how best to utilize each other. Clients can be great catalysts for new and innovative ideas, features, and functions, just as vendors and consultants can share time-tested best practices with clients who are behind the learning curve. A service provider that doesn't heed client input is no more absurd than a client needlessly pursuing a long, lonely learning curve on some new technology without any guidance whatsoever. And so several of us put our heads together and decided to launch a new initiative. The Coalition of Professional Services Providers is designed to jump start this dialog. The in-house practitioners have several professional associations through which they can collaborate, communicate, network, and learn. And while some of these associations warmly embrace consultants and service providers as members, most don't. CoPSP serves as a platform for those providing services and products to come together and communicate on what's working and what can be improved, to collaborate on best practices, to work with other associations to develop mutually beneficial sponsorships, to help newcomers to the field learn how to market and sell to the professional services segment, and to provide resources and training. We hope you join for the ride. More information here. Apply here. Facebook here. Join the LinkedIn Group here. Follow on LinkedIn here. Twitter here. 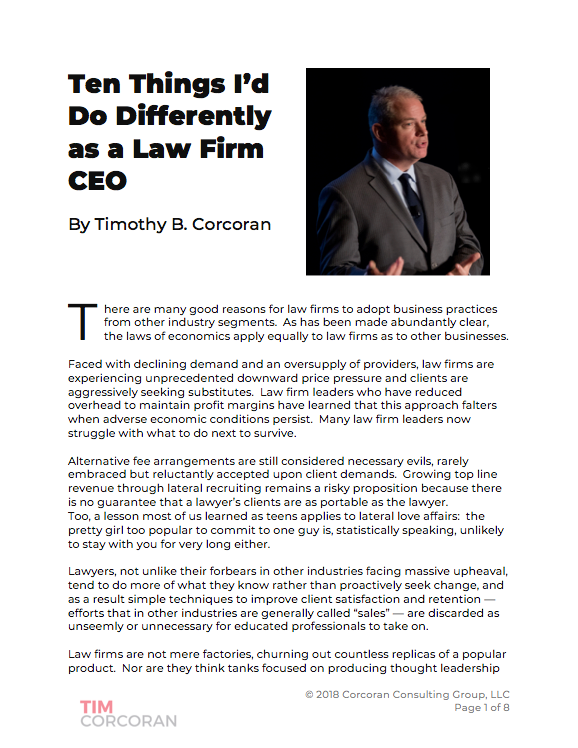 Timothy B. Corcoran was the 2014 President of the Legal Marketing Association and is an elected Fellow of the College of Law Practice Management. He delivers keynote presentations, conducts workshops, and advises leaders of law firms, in-house legal departments and legal service providers on how to profit in a time of great change. For more information, contact him at +1.609.557.7311 or at tim@corcoranconsultinggroup.com.